Laser-induced breakdown spectroscopy of CuO plasma in the presence and absence of magnetic field has been investigated. The plasma was generated by employing Nd: YAG laser (532 nm, 9 ns) at various pulse laser energy ranging from 100 to 400 mj in a vacuum. The increasing of pulse laser energy in the presence and absence of the magnetic field had shown increasing in electron density while the electron temperature was decreases. The presence of the magnetic field cause to a rising the electron density but it reduces the electron temperature comparison with the case of absence of the magnetic field. According to theβ value distribution along the target, the results shows in the central region of the target the plasma plump that produced by laser is in a good confinement in this region in contrasted with edge region of the target region. where Iji is the relative intensity (in arbitrary units) of the emission line between the energy levels i and j, λji its wavelength (in nanometres), gi is the degeneracy or statistical weight of the emitting upper level i of the studied transition, and Aji is the transition probability for spontaneous radiative emission from the level i to the lower level j. Finally, Ej is the excitation energy (in eV) of level i, k is the Boltzmann constant, N state population densities. The electron temperature can be calculated from the slope of best linear fit in the plot between versus Ej. This plot called Boltzmann plot. Where Δλ is the FWHM of the line, and ωs is the Stark broadening parameter, that can be found in the standard tables Nr is the reference electron density which equal to 1016 (cm–3) for neutral atoms and 1017 (cm–3) for singly charged ions. Where K is the Boltzmann constant, ne is the electron density, B is the magnetic field intensity and Te is the electron temperature . 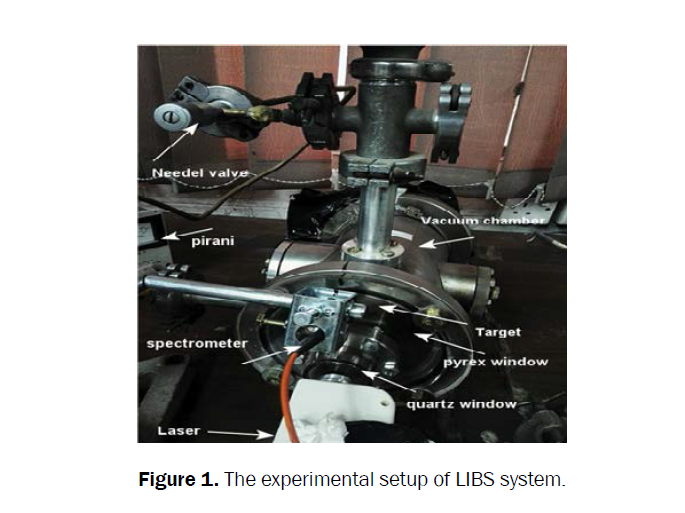 Figure 1 illustrated the experimental setup of LIBS system used for the detection and identification of spectral lines of laserproduced CuO plasma in the presence and absence of magnetic field. The target was bombarded by Nd: YAG pulses laser (9 ns duration time, 6 Hz frequency, and wavelength of 532 nm) with pulse energy ranging from 100 to 400 mJ which was used as an irradiation target for the generation of CuO plasma, at an angle of 45°. The laser was focused on target by using the convex lens of focal length 10 cm to produce plasma plume. The circularly shaped pellet of the copper oxide target with diameter 3 cm is placed inside a vacuum chamber. Argon gas was filled the chamber at a pressure at different pressure (from 0.2 and 0.4 Torr) which was measured by aprecisionable pressure gauge. The vacuum chamber consisted from a cylindrical stainless steel tube. The two ends closed by Pyrex windows, by two stainless steel flanges, and with small quartz window fixed in it is center, that allows for a laser pulse to shoot the CuO target. Two small pipes connected to pumping systems, while the other was used to deliver the argon gas (with purity of 99.9%).Two types of the permanent magnetic located under the target; the first one is the outer and the second is the inner which is located inside the outer circular permanent to get on the magnetic field intensity . Figure 1: The experimental setup of LIBS system. Figure 2 shows the radial profile of the magnetic field distribution along the CuO target. One can observe from this figure, the magnetic field intensity has nonuniform distribution along the target. It is clear from this figure the radial profile on the magnetic field along the target is non-uniform. The magnetic field intensity has two peaks which has the maximum value is approximately 41 mT. Figure 2: The magnetic field distribution as function along the CuO target. The values of Te is calculated by using the Boltzmann plot method (Equation (1)) and are plotted in Figure 3. Many features can be observed from this figure which are; the electron temperature decreasing with increasing of gas pressure in the presences and absence of a magnetic field.The electron temperature increase in the presence of a magnetic field. The increasing of inelastic collisions of an electron with Ar atoms with increasing of gas pressure is responsible for decreasing of Te with increasing of pressure. While the increasing of Te in the presence of a magnetic field can be explained as, the magnetic field will traps the electrons in the region near the target surface. Therefore, the electron will gain the energy from the laser pulse and this will continue increases the electron temperature. 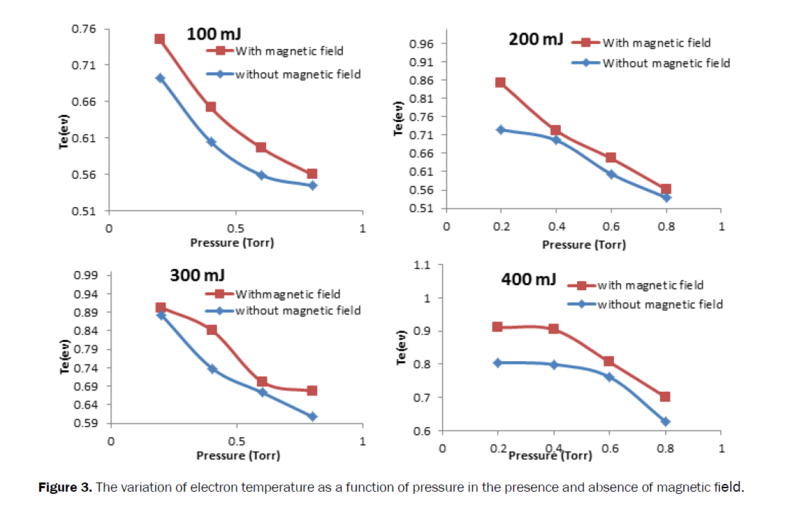 Figure 3: The variation of electron temperature as a function of pressure in the presence and absence of magnetic field. 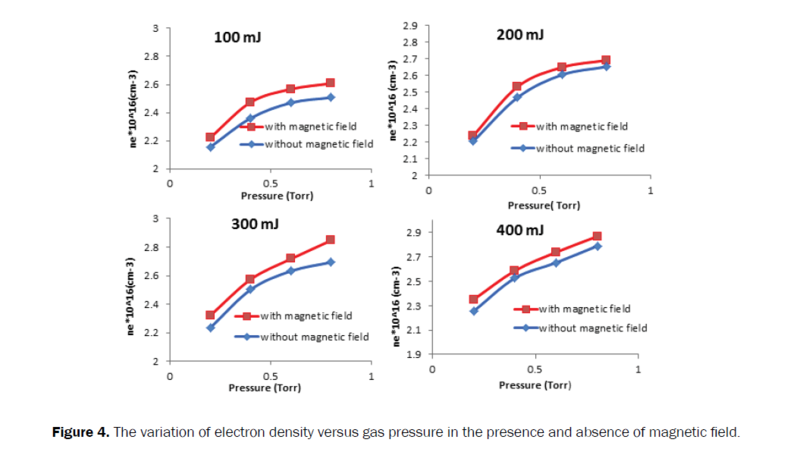 Figure 4 had shown the variation of electron density (ne) versus gas pressure at different pulse laser energy in the presence and absence of the magnetic field. One can observe in this figure that the electron density increasing with increasing of gas pressure with higher rate in the presence of magnetic field for all pulse laser energy. The increasing of ne with increasing of gas pressure may be due to the inelastic collisions of electrons with Ar atoms which generated more electrons. On the other hand, the arising of the value of ne in the presence of magnetic field may be caused by the magnetic field will confinement the electrons and these electrons will suffered inelastic collision with Ar atoms then the secondary electrons will be generated more. Figure 4: The variation of electron density versus gas pressure in the presence and absence of magnetic field. The values of β are evaluated by using eqn. (4) with Figures 3 and 4. Figure 5 illustrated the radial profile of the β value at different pulse laser energy and gas pressure. Many features can be observed in this figure; the values of β are less than on in all radial point in the region near the target surface. The maximum values of β occur at the edge of target. The increasing of pulse laser energy causes to increasing of β values. While the increasing of gas pressure causes to decreasing of β values. So that, one can concluded that from these results the fact that; according to the magnetic field configuration the magnetic field has a good confinement in the central region of the target (region of low β region) where the magnetic field pressure greater than plasma pressure. 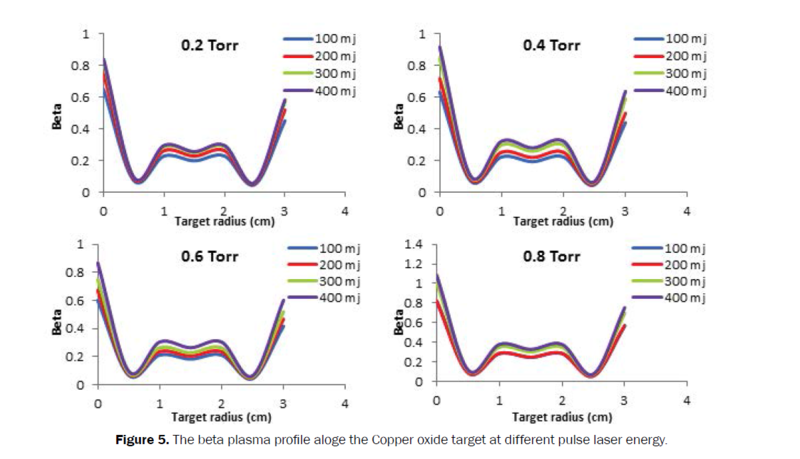 Figure 5: The beta plasma profile aloge the Copper oxide target at different pulse laser energy. The plasma characteristics that produced from the interaction of Q-Switching Nd: YAG laser at wavelength of 532 nm with solid CuO target in vacuum was studied. this work included the influence of pulse laser energy on the electron temperature, electron density and β parameter. One can observe in the presence and absence of magnetic field, when the pulse laser energy was increased the electron temperature was decreased while the electron density increased. While according to the β value distribution along the CuO target the results show the fact that the magnetic field has a good confinement in the central region of the target (region of low β region) where the magnetic field pressure greater than plasma pressure. Diwakar PK and Hahn DW. Spectrochim Acta-Part B At Spectrosc 2008;63:1038-1046. Kaiser J, et al. Utilization of the Laser Induced Plasma Spectroscopy for monitoring of the metal accumulation in plant tissues with high spatial resolution. Mod Reseach Educ Top Microsc 2007;434-441. Sharma K and Thareja RK. Plume dynamics of laser-produced aluminum plasma in ambient nitrogen. Appl Surf Sci 2005;243:68-75. Rai VN, et al. Effect of steady magnetic field on laser-induced breakdown spectroscopy. Appl Opt 2003;42:3662-3669. Arshad A, et al. Effect of magnetic field on laser-induced breakdown spectroscopy of graphite plasma. Appl Phys 2016;122:63. Bellan PM. Fundamentals of plasma physics.2006. Pagano C. Influence of transverse magnetic field on expansion and spectral emission of laser. 2015;155:205. El Sherbini M and AI Aamer AAS. Measurement of Plasma Parameters in Laser-Induced Breakdown Spectroscopy Using Si-Lines. World J Nano Sci Eng 2012;2:206-212. Mansour SAM. Opt Photonics J 2015;5:79-90. El Sherbini M. Opt Photonics J 2012;2:278-285. Li XF, et al. Front Phys 2012;7:721-727. Raju MS, et al. Influence of magnetic field on laserproduced barium plasmas: Spectral and dynamic behavior of neutral and ionic species. J Appl Phys 2014;116:153301.